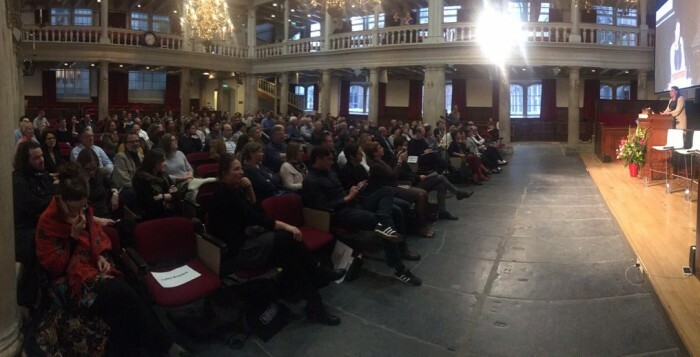 Last week I attended the event ‘My phone, my phone, my irresistible phone’ by The John Adams Institute in Amsterdam. During the event about the dominance of the smart phone in current times, several speakers shared their opinions on this big topic that we’re all part of. One of them was Adam Alter, American author of Irresistible (translated by Maven Publishing as Superverslavend). He talked about techniques used by tech-companies to make their products more and more addictive and explains it’s not always the fault of our own weaknesses when we’re once again unable put the phone down. Watch the video below to get an impression of what it was like and get an insight in the views of Adam. Wouter van Noort is a Dutch journalist for NRC and author of recently published Is daar Iemand?. His book shares the topics Adam talked about and Wouter dives even further into our relationship to technology. The smart phone is taking over our lives. How is this obsession changing us? And why or why isn’t that a bad thing? In the interview in Dutch he tells all about it. Is it really as bad as we sometimes think? Marleen Stikker, founder of the Waag society, an institute for arts, science and technology, thinks questions the ethical sides of current tech-developments and business models originating in Silicon Valley. The smartphone addiction and data exploitation on us, the user, has reached unprecedented heights. Marleen believes we should develop more ethical business models in Europe instead of joining Donald Trump. We discussed some of the examples in the Dutch interview.